The Price Company began making candles in 1830 and by the end of the century were the largest candle producers in the world. 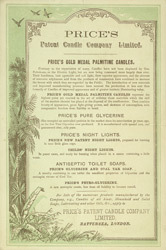 It held over 100 product patents, including patents for beeswax and stearine candles. Beeswax candles were particularly expensive and were used only in chandeliers and candelabras, and Price's began to develop candles with stearine, a vegetable based wax, as a cheap alternative.